The company was incorporated as a public limited company on 3rd November 1999 under the Companies Act 1994 and obtained registration from the Controller of Insurance on 23-12-1999 under Insurance Act 1938. The authorized capital of the company is Tk. 300 million consisting of 3,000,000 ordinary shares of Tk. 100 each. The sponsor/subscribers have already contributed to the paid up capital of Tk. 60 million. It is considered that higher paid up capital strengthens company’s foundation and provides sound financial standing for the company. This capability enhances the company’s strength to attract clients to take insurance. With this financial position the company can settle large claims from its own sources, which contributes in generating public confidence towards the company. Thus, large paid up capital not only helps building up a large business portfolio but also generates substantial amount of profit ensuring a good return to the shareholders. Insurance is a highly technical and risk bearing business. Before taking an insurance policy clients usually assess the quality of the management and financial soundness of the company. If the management is dependable and the financial condition of the company is sound, the business is bound to grow fast which will ultimately generate profit for building up company’s reserve as well as declaring dividend for the shareholders. The company does not have any associate, subsidiary/ related holding company. The Company conducts the business operations under the supervision of Board of Directors and the legal frame work of the Insurance Act 1938 and Insurance Rules 1958, as amended from time to time. The Company operates through the Head Office at Dhaka, Zonal Offices at Chittagong, Khulna and the branches through out the country. Network of professional staff and commission agents promote and conduct the business. Agrabad Noor Chamber (2nd Floor) 34, Agrabad C/A, Chittagong. Jubilee Road 599, Ramjoy Mohajan Lane, A.K.Tower (2nd Floor), khatungonj Chittagong. Narayangonj Midtown Complex (3rd Floor) 54, B. B. Road Road, Narayangonj. Khulna 69, Khan-A-Sabur Road, Nau Paribahan Malik Bhaban, Khulna. Faridpur 103, Goal Chamot (1st Floor), Hazra Tala, Faridpur. Chaumuhuni ShamsuBuilding (2ndFloor), Bank Road, Chaumuhuni etc. Ownership of Standard Insurance Ltd.
No Officers owned any shares of the Company. All Directors/ shareholders hold more than 5% shares of the company. Contributions of Insurance to Growth and Development. Insurance serves a number of valuable economic functions that are largely distinct from other types of financial intermediaries. In order to highlight specially the unique attributes of insurance, it is worth focusing on those services that are not provided by other financial services providers, excluding for instance the contractual savings features of whole or universal life products. The indemnification and risk pooling properties of insurance facilitate commercial transactions and the provision of credit by mitigating losses as well as the measurement and management of non diversifiable risk more generally. Typically insurance contracts involve small periodic payments in return for protection against uncertain, but potentially severe losses. Among other things, this income smoothing effect helps to avoid excessive ant costly bankruptcies and facilitates lending to business. Most fundamentally, the availability of insurance enables risk averse individuals and entrepreneurs to undertake higher risk, higher return activities than they would do in the absence of insurance, promoting higher productivity and growth. Insurance Contributes Positively to Economic Growth. The deepening of insurance markets makes a positive contribution to economic growth. While life insurance is causally linked to growth only in higher income economies, non life insurance makes a positive contribution in both developing and higher income economics. Some research suggests that the positive contribution of life insurance to growth in primarily through the channel of financial intermediation and long term investments. However, it is important to note that these studies do not address the important contributions to individual and social welfare from risk management. Strong Complementarily between insurance and Banking. Insurance and banking system deepening appear to play complementary roles in the growth process. Although insurance and banking separately each make positive contributions to growth, their individual contributions are greater when both are present. There is also some evidence that the development of insurance markets contributes to the health of securities markets. As suggested above, there are many reasons why this complementary relationship might hold, including the likelihood that the presence of property casualty insurance avoids inefficiently high levels of bankruptcy and helps to facilitate credit transactions for houses, consumer durables, and small-and medium-sized business that bank typically finance. Separate evidence that a growing presence of life insurance providers and pension funds is associated with more efficient banks suggests that they promote some capital market discipline on the investment side that is also complementary. Of course, if growing insurance markets make a positive contribution to growth, then it is important to understand in turn the enabling factors that contribute to the development of robust insurance markets. Here, the evidence points to rising incomes, macroeconomic stability and financial deepening as the key drivers of insurance market growth, against the backdrop of a conducive regulatory and supervisory environment. • The general objective of this report is to fulfill the requirement of internship report. • To acquire practical experience in different Insurance service of standard Insurance Ltd.
* To find out their present financial practices. * To present economic contribution. * To find out financial problems. * To suggest measures to overcome the problem. * To examine the present financial practices. * To all aspect of the financial management of the company. * To take interview the key person of financial management. * To examine financial records. * To examine and review the financial statement. * To examine the organization structure of the accounts and MIS section of the company. * To identify the various sources of financial data and their compilation procedures. * To evaluate the reliability of data and its impact on the performance of the company. * To recommend some suggestion for standard Insurance company. In complete this report 1 have followed a systematic study which include working, inspecting and talking to the executives at different levels of the organization to know the present scenario of the insurance service practice. All the branches of Standard Insurance Ltd in Bangladesh have been taken into consideration as the population of this report. I he information incorporated in this report has been gathered from primary and secondary sources. Apart from this, a review of related circular and office circular as well as face-to-face interview of the executives, officials and clients were carried out. * Face to face conversation with the respective officers and staff of the Branch. * Informal conversation with the clients. * Relevant file and documents study as provided by the concerned officers. * Practical work exposures from the different desks of the department of the branch. * Unpublished data received from the branch. * Various books, periodical seminar papers, training papers, manuals, web silo etc. related to the topic. This report is an exploratory and descriptive one in nature and involved with both oral and written source of data in being used and has been administered by collecting both primary and secondary data. Personal interview through oral non-questionnaire technique is being used in this report. Insurance is a small but growing sector in Bangladesh. Since the independence of the country, the insurance industry experienced a major structural transformation. The government of Bangladesh nationalized insurance industry in 1972 and by the virtue of the Bangladesh Insurance (Nationalization) Order 1972, except postal life insurance and foreign life insurance companies, all insurance companies were placed in the public sector under five corporations. In 1973 the ‘Insurance Corporations Act 1973’ was enacted and a restructuring was made in the insurance industry by forming two corporations, Sadharan Bima Corporation and Jibon Bima Corporation. Later the Insurance Corporations Act 1973 amended in 1984 allowed insurance companies in the private sector to operate side by side with Sadharan Bima Corporation and Jibon Bima Corporation. At present a total of 43 general insurance companies are operating in the private sector. Though the number of General Insurance Company is more than two times of Life Insurance Company their contribution to the industry is only around 25% considering assets, premium and investment. Fareast Islami Insurance Co. Ltd.
Padma Islami Insurance Limited Paramount Insurance Company Ltd.
Insurance penetration of Bangladesh as a measure of premium revenue as a percent of GDP was 0.61, which was the lowest among the South Asian countries (India: 3.14; Pakistani. 67; Srilanka: 1.46). Similarly, insurance density, which is premium per capita, is very low compared to other South Asian countries (Bangladesh: US$2.5; India: US$22.7; Pakistan: US$4.6 and Srilanka: US$ 16.3). Premiums are considered to be the main indicator of an insurance company’s performance. Usually, higher premium accumulation results not only in increase underwriting income but also leads to an addition in the investment stock and reserves of the company. during 20(Ji-20f)!J. But the share of state owned companies have been declining over the years. In fact, the composition of assets shows a gradual shift in the ownership structure from state controlled to the private sector. 1n 2007 state-owned general insurance company, SBC had a share of 36.51% in total asset of the general insurance industry, which declined to 29.88% in 2011 registering an average growth rate of 2.92%. While the asset of private general insurance companies have increased at an average rate of 9.48%. So the majority shares are now controlled by the private sector insurance companies. Investments are generally the largest asset of an insurance company. The investment portfolio of insurance companies usually consists of listed shares, corporate debt and money market instruments. The-share of investment of life insurance companies increases substantially over the years (78.17% in 2011). In case of general insurance companies there was a high growth in investment by the private sector, which resulted in the steady rise of the share of private sector in total investment. In fact, investment income has increased, indicating higher returns from diversified investment in both government securities and equities. Competition enhances efficiency of the market and leads to product diversification and fair pricing of insurance products. However, it is alleged that presence of a large number of general insurance companies in a small market is creating interruption in smooth functioning of the overall insurance industry. Only 10 companies among 45 private companies control the general insurance industry as they contribute 50″c of net premium, 64% of net profit, 75% of investment and 66 of % total assets to the industry. Rising incomes, Moderate inflation and Financial Deepening are Key Drivers. Growth in insurance coverage is strongly associated with rising incomes, the development of an increasingly sophisticated banking sector, and low or moderate levels of inflation. The strong contribution of rising incomes to greater insurance coverage might be attributable to demand factors (rising demand for coverage as individuals become wealthier), supply factors (it becomes more cons-effective to provide insurance as the economy expands, providing both a stronger institutional environment and greater returns relative to transactions cost), or a combination. The overall instructional environment plays an important role, in terms of political stability and openness as well as government effectiveness, rule of law and control of corruption. Religious factors also play a role, with insurance consumption inversely correlated to the share of the population that is Islamic. Financial Performance of Standard Insurance Ltd. The following table shows the shareholding of the Company. 10% on Net Premium Income. SWOT Analysis is overall evaluation of the company’s Strengths, Weakness, Opportunities and Thereat. Strengths of Standard Insurance Ltd.
* New and innovative service. * They have good reputation for fast communication. * Quality service process and procedure. Weakness of Standard Insurance Ltd.
* Short number of employee. * Require more proper co-ordination between the different department. * Salary structure and other facilities of the employee is not comparative compare to renewed another industry. 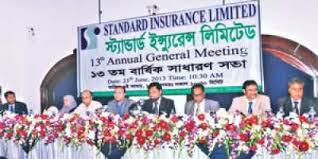 Opportunities of Standard Insurance Ltd.
* Can expand their business area by establish new branch. * Removal of international trade service barriers. * Opportunity to turn the young educated executive team a dynamic one by initiating a good corporate culture. * Attain different trade/insurance fare and get new idea related with today’s business. Threat of Standard Insurance Ltd.
* New general insurance company enter in the market regularly. * Govt. tax and vat structure in not congenial. * Because of the more competition among the general insurance company party get more options. That’s why party wants more commission. * Switching jobs by the skilled and dedicate employee due to under-served salary and benefits and power centralization by the top management. In this research I have represented an efficient way to develop mentality of people about Financial Performance of Standard Insurance Ltd. Also I showed the contribution of Standard Insurance Ltd. in our economy. Though I have some limitations I do firmly believe that it will help any people if he/she wants to get a successful service of Standard Insurance Ltd.
Value chain has been identifying ways to create more customer value. The company success depends not only on how well each department performs its works but also on how well the various department activities are coordinated. The link age between activities are crucial for corporate success. The linkages are flows of information, goods are services as well as system and process for adjusting activities. In the result, the linkages are about seamless and information flow between the value chain activities. This discussion reviews the management of value chain advocates to align strategy finance, information flow, human systems and decision-making processes to achieve the greatest value for the standard insurance customer. Regular monitoring and top to down, bottom to up feedback allow for continuous improvement. In such a situation, I would like to recommend the followings so that the company will be able to offer the lowest lead-time and render much better customer services as well. * Company should not plan to produce with out considering its actual plants capacity. * Company should introduce more efficient layout and work methods. * Meeting targets and standards and learning more skills. * Avoiding accidents and making useful suggestions. * Advertisement activities is low, I think Standard insurance company has a great future to follow latest advertisement policy. * Out source (O/S) commission should pay in cheque. * The company should also pursue its vision of innovation, speed and service driven marketing, activities to the complete satisfaction of the customers. * Creating an open mind to-wards improvement process. * Over coming the cultural and attitudinal for the improvement. * Transfer of process improvement methodology. * Establishing preliminary improvement targets and action plans on some of the issues. 1. Prospectus of Standard Insurance Ltd.
Issue Date of the prospectus : April 03, 2012. 2. Prothom-Alo Newspaper, Published Date : January 16, 2012. 3. Annual report of Standard Insurance Ltd. 2008 & 2011.